This Cuisers Yachts 3672 Express was a great project to work on! 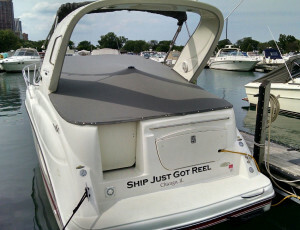 The owner recently purchased this yacht in Wisconsin last November. We were able to measure 3D via our Proliner with the wind blowing 25 mph+. The owner went with top notch materials and it shows. Sunbrella Supreme Marine (Black on Black) – Sunbrella Supreme is a luxurious, waterproof exterior marine fabric featuring Sunbrella canvas on the exterior face and a special Sunbrella flocking on the reverse side. The unique bonding process creates a waterproof Sunbrella canvas with a beautifully soft headliner underneath. Markrolon – Makrolon AR2 abrasion resistant polycarbonate sheet offers superior abrasion resistance and glasslike surface hardness, along with the impact strength of polycarbonate. It features a unique clear hard coat finish that resists all types of abuse, from physical attack to chemicals and spray paint. Additionally, Makrolon AR2 offers resistance from yellowing and hazing for longer service life in high profile applications. Strataglass – A remarkably clear and scratch-resistant vinyl sheet, Strataglass performs well in boat curtain, automotive window and awning applications, where perfection of clarity and lack of distortion are demanded. This premium, flexible vinyl sheet resists scratching from handling, etching from industrial fallout and damaging effects from the sun’s rays. Made in the USA. 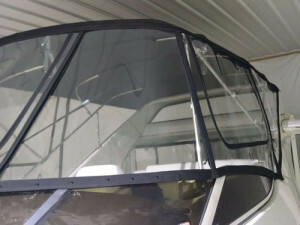 Cockpit covers are one of the most common types of boat covers used in the marine industry. 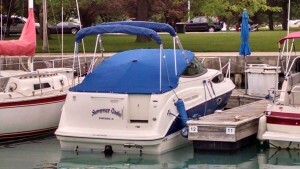 These types of covers can be used on all types of powerboats and have different variations available. Most extend from the top of the windshield toward the aft of the boat. Another option is to extend the cover over the windshield protecting the windshield and the dashboard area from constant direct sunlight. Have you ever seen a dashboard that faded out, an over the windshield cockpit cover would have helped postponed this fading. Frequently the boat covers are connected with button snaps but there are also other variations of fasteners that can be used. Twist the Dot and Lift the Dot fasteners can be beneficial in specific situations where there is extreme tension on the canvas. Multiple types of fabric can be used for the cover. 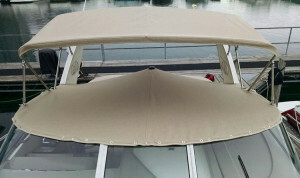 Sunbrella is a popular option and has over 70 fabric options in marine grade canvas available. A complete list of available can be found here – Sunbrella Samples . WeatherMax has super high strength and durability combine with long-term color retention and is cost-effective fabric available for marine covers and tops. Both fabrics have outstanding durability, high water repellent and excellent breathability. We measure all of our cockpit covers via 3D and build out the design in CAD software. This provides for a great fitting cover that will be enjoyed for years to come. Some of the pictures show the rendered design in a “Mesh” along with the finish product. Please contact us with any of your cockpit cover needs. 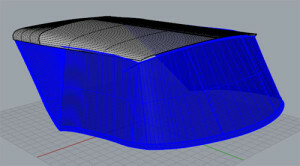 We measure in 3D and construct the enclosures in CAD software providing an efficient way to fabricate enclosures. 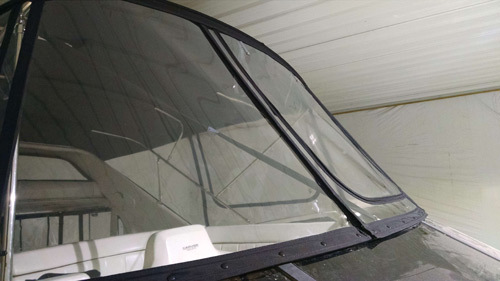 We were contacted by the owner to fabricate a new Flybridge Enclosure during the off-season while the boat was being stored indoor at Marine Services in Dolton, IL, a class A facility. 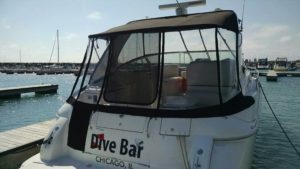 The owner requested the enclosure to be similar to the existing enclosure with roll up windows on the center panel along with the port and starboard side windows. The yacht has a larger size bimini with 4 bows and arch attachment aft along with a total of 7 panels. This was a very fun project and we have a complete list of materials used below too. 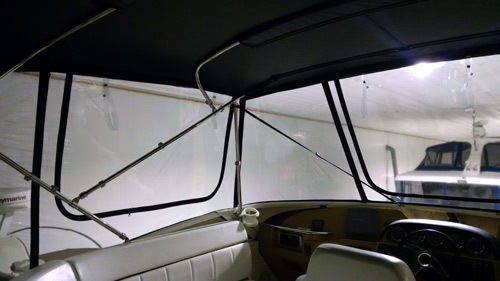 SeaMark Canvas – SeaMark is a great option for bimini tops. 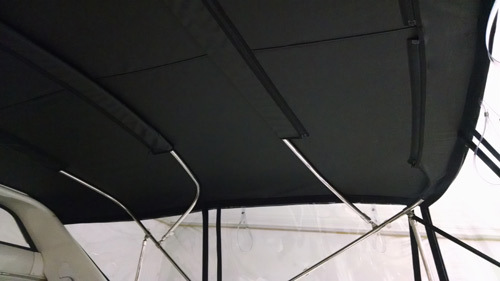 It’s essentially Sunbrella fabric with a rubberized coating which provides 100% waterproof protection. 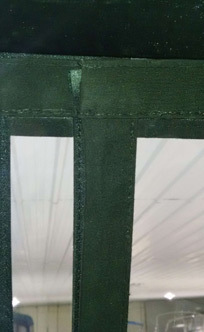 Sunbrella Canvas – In addition to the SeaMark, we used Sunbrella fabric which is lighter than the SeaMark and is great for constructing the panels. Strataglass (40 gauge clear) – This type of isenglass is perfect for the midwest climate. It’s scratch and UV resistant providing 10+ years of enjoyment. It won’t yellow like traditional double polished isenglass and has a minimal shrinkage of 1-2%. GORE® TENARA® Sewing Threa – Manufactured from 100 percent expanded polytetrafluoroethylene (PTFE), the chemical name for Teflon® from DuPont. Expanded PTFE is two to three times stronger than conventional PTFE. Is your thread breaking down? Then you don’t have Tenara which is guaranteed for life! Lenzip Zippers – Located in Rolling Meadows, Lenzip offers a lifetime guarantee on all of their zippers and is an excellent choice for marine grade zippers. DOT Fasteners – we used DOT black enamel snaps to give the panels a nice clean finished look. Interior Bimini Top – Wrinkle Free Boating! Where’s the Zipper? We use a technique to hide the zippers between panels resulting in a clean finish inside and out!